We are the UK’s leading retailer for games room equipment for both home and commercial customers with a market leading range of high quality products, many of which are exclusive to us. Everything comes with free delivery, all backed up by award-winning customer service. Our dedicated commercial sales team specialise in projects for schools, universities, pool halls, pubs, clubs and holiday parks, as well as working with interior designers and holding private sales events for high net-worth clients. We offer business leasing, and with over 40 lenders we can cater for startup businesses or long-standing companies who are looking to spread the cost of their investment for large orders, which includes premises re-fits. You can visit us at our Showrooms in Elberton, which is just north of Bristol. We are just ten minutes away from the Cribbs Causeway shopping centre. For directions please see our How to Find Us page. We have three showrooms on the same site, with 40 pool tables, 20 pinballs, 25 arcade machines, 9 table tennis tables, 3 foosballs and 8 jukeboxes, plus bars, memorabilia and neon signs, giving you the opportunity to make the right choice for you and your business. We have the largest range of commercial pool tables in the country, from all the top manufacturers in the UK, Europe and America, the majority of which are kept in stock so that we can get the right table to you as quickly as possible. We have all the different types of pool covered. 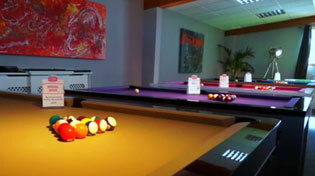 Choose from English Pool Tables and American Pool Tables, so whether you are looking for a 6ft or 7ft English table for your business or for 7ft, 8ft or 9ft American tables, we've got you covered. There is a huge range of finishes available. We can supply a range of wood finishes in light or dark walnut, oak, black or white, and even carbon fibre and aluminium effects are available. If you prefer solid wood we offer a huge choice on our luxury pool tables, including cherry, mahogany, oak, beech, teak, tulipwood, and walnut. If you are looking for something a little more extravagant we have the largest range of luxury tables available in the UK, with the majority of them being exclusive to Home Leisure Direct. Whether you are a designer or an operator of a hotel, high-end bar or pool hall looking to differentiate yourself from the norm, we will have something for you. We consider ourselves to be the market leaders in the UK. We are certain you will agree once you experience our products and service. If you have any questions about any pool table we sell, please give us a call on 0800 622 6464 and one of our friendly expert advisors will be happy to help you. Shuffleboard has been extremely popular in America for years, and with an explosion of popularity in Scandinavia over the last few years the game is now finding its way into bars, clubs, hotels and homes across the UK. We have the largest range of shuffleboards available in the UK with the three top brands - Hudson, Brunswick and Hurricane - all available exclusively from Home Leisure Direct. From 9ft to 22ft tables, we have the right size to suit your space and can make sure it meets your requirements. All our commercial tables come with free installation and an amazing ‘all you need’ accessory pack, worth over £1,700. This pack includes pucks, a table brush, 24 cans of wax, 12 cans of silicone spray, 12 cans of cleaner, a humidifier and a gauge. Table tennis has seen a massive surge in popularity over the last few years with dedicated ping pong bars opening up across the country. As well as the game being extremely fun and popular with all age groups, the health benefits make it a great choice for schools, colleges, universities, camping parks, office breakout rooms, hotels and bars. It serves well either as an inexpensive investment to add a free-play service that offers great value, or as a chargeable addition to your venue on an hourly hire basis. Our range of products includes tables which are suitable for use by schools and colleges, camping parks, clubs and even for competition use with models recognised by the ITTF. We also stock a luxury range for designers, office breakout rooms and hotels. In addition, we carry an extensive range of accessories including bats, balls, practice robots, net and post sets, covers and competition equipment. With almost all models kept in stock, we can usually deliver within 2-7 days. Table football is a staple across the country in bars, holiday parks and universities. A relatively small investment, with commercial tables starting from under £630, football tables offer a fantastic return on investment with little to no maintenance and a steady and consistent revenue stream. We stock tables for indoor and outdoor use, many of which come equipped with coin mechanisms for commercial purposes, and some of which feature glass tops to prevent the ball being removed and drinks or debris finding their way onto the pitch. For hotels looking to add extra value for guests with luxury free-play versions, we have iconic brands like Sulpie and Bonzini that are fully customisable to match the interior of your venue. The jukebox has long been an object of desire for many people, either from fond memories of a local diner or bar having one, or from old 50s movies featuring a classic Wurlitzer or Seeburg playing in the background. We have a great range of commercial jukeboxes for sale, from the top brands available in the world today. Sound Leisure - who are based in Leeds, England - manufacture a stunning range of CD jukeboxes, made in solid wood and using genuine metal chrome cappings. With digital, CD, or vinyl options available we have you covered for whatever your business may require, and even offer custom branding like the Jack Daniel’s Rocket 88, a Home Leisure Direct exclusive. Arcade machines today represent a new golden era of opportunity, as kids from the 80s, 90s and 00s are now aged between their late 20s and late 30s. These people are looking for a new offering from bars and clubs that will take them back down memory lane. Our multi-game arcade machine sales are up 160% as a result of bars taking advantage of this opportunity. ‘Barcades’, which are already extremely popular in the USA, are now opening up all over the UK, offering craft beer, food, music and arcade games for customers to enjoy. We have the largest range of fully licensed, customisable multi-game arcade cabinets available in the UK. With cocktail cabinets, numerous stand-up machines and hybrid machines such as the Nu-Gen all available with or without coin mechanisms and the option to have your own custom branding applied, now is the time to jump on the barcade bandwagon. We also stock a massive range of brand new and reconditioned dedicated arcade cabinets such as driving machines, gun games, ride-on, sit-in and dance machines. We have all the top brands: Sega, Namco, and Global VR.